Why all the negativity towards matplotlib? In my opinion, there are a couple of reasons why matplotlib is challenging for the new user to learn. First, matplotlib has two interfaces. The first is based on MATLAB and uses a state-based interface. The second option is an an object-oriented interface. The why’s of this dual approach are outside the scope of this post but knowing that there are two approaches is vitally important when plotting with matplotlib. The reason two interfaces cause confusion is that in the world of stack overflow and tons of information available via google searches, new users will stumble across multiple solutions to problems that look somewhat similar but are not the same. I can speak from experience. Looking back on some of my old code, I can tell that there is a mishmash of matplotlib code - which is confusing to me (even if I wrote it). New matplotlib users should learn and use the object oriented interface. Another historic challenge with matplotlib is that some of the default style choices were rather unattractive. In a world where R could generate some really cool plots with ggplot, the matplotlib options tended to look a bit ugly in comparison. The good news is that matplotlib 2.0 has much nicer styling capabilities and ability to theme your visualizations with minimal effort. The third challenge I see with matplotlib is that there is confusion as to when you should use pure matplotlib to plot something vs. a tool like pandas or seaborn that is built on top of matplotlib. Anytime there can be more than one way to do something, it is challenging for the new or infrequent user to follow the right path. Couple this confusion with the two different API’s and it is a recipe for frustration. Despite some of these issues, I have come to appreciate matplotlib because it is extremely powerful. The library allows you to create almost any visualization you could imagine. Additionally, there is a rich ecosystem of python tools built around it and many of the more advanced visualization tools use matplotlib as the base library. If you do any work in the python data science stack, you will need to develop some basic familiarity with how to use matplotlib. That is the focus of the rest of this post - developing a basic approach for effectively using matplotlib. 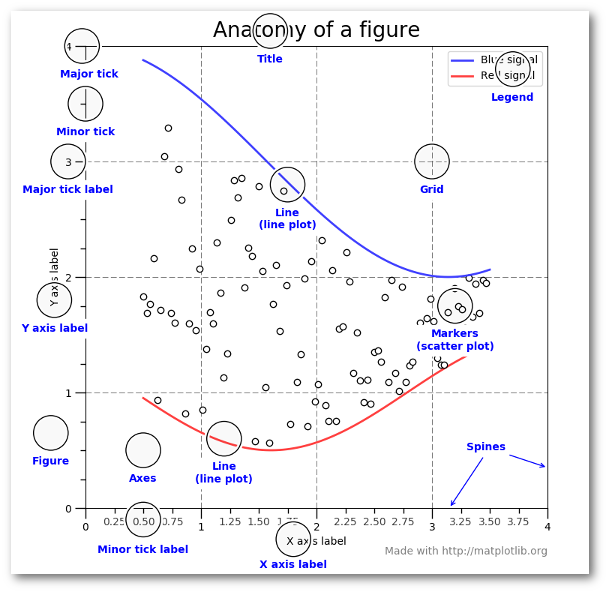 Learn the basic matplotlib terminology, specifically what is a Figure and an Axes . Always use the object-oriented interface. Get in the habit of using it from the start of your analysis. Start your visualizations with basic pandas plotting. Use seaborn for the more complex statistical visualizations. 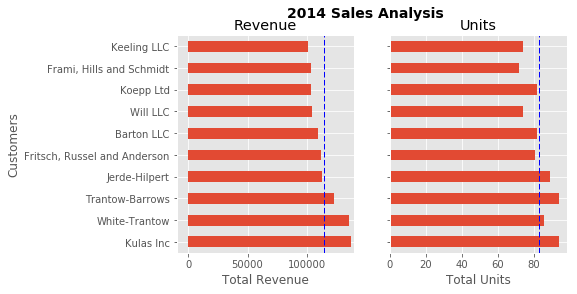 Use matplotlib to customize the pandas or seaborn visualization. The other benefit of this knowledge is that you have a starting point when you see things on the web. If you take the time to understand this point, the rest of the matplotlib API will start to make sense. 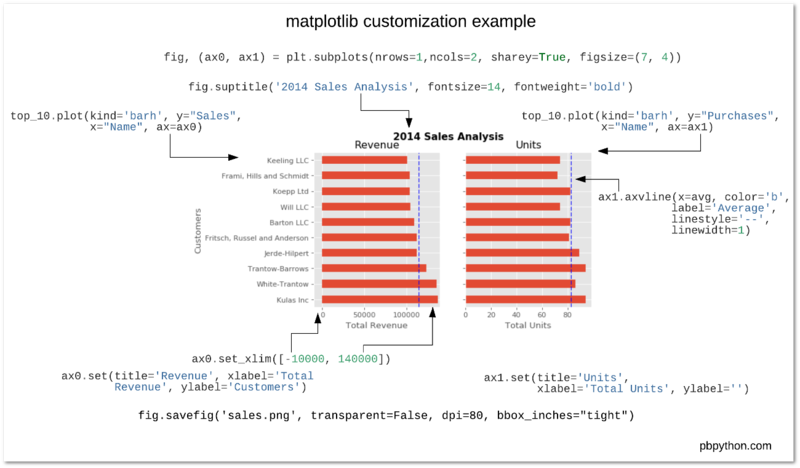 Also, many of the advanced python packages like seaborn and ggplot rely on matplotlib so understanding the basics will make those more powerful frameworks much easier to learn. Finally, I am not saying that you should avoid the other good options like ggplot (aka ggpy), bokeh, plotly or altair. I just think you’ll need a basic understanding of matplotlib + pandas + seaborn to start. Once you understand the basic visualization stack, you can explore the other options and make informed choices based on your needs. 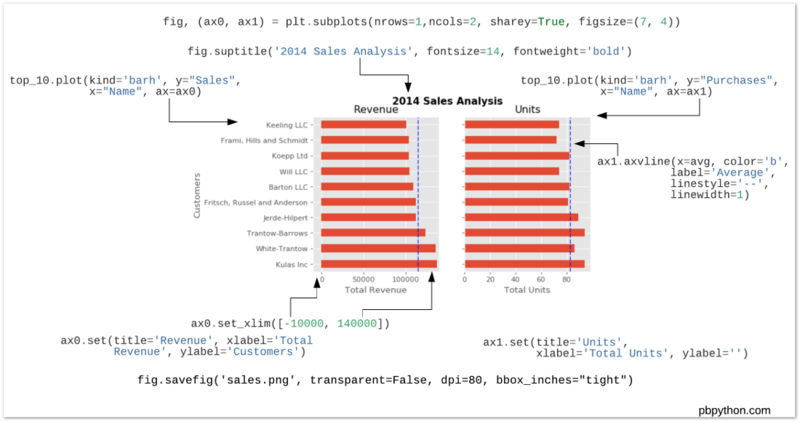 The rest of this post will be a primer on how to do the basic visualization creation in pandas and customize the most common items using matplotlib. Once you understand the basic process, further customizations are relatively straightforward. I have focused on the most common plotting tasks I encounter such as labeling axes, adjusting limits, updating plot titles, saving figures and adjusting legends. If you would like to follow along, the notebook includes additional detail that should be helpful. 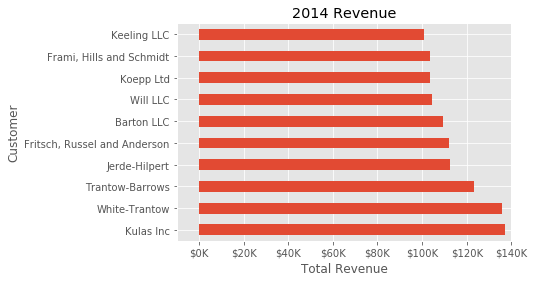 The data consists of sales transactions for 2014. In order to make this post a little shorter, I’m going to summarize the data so we can see the total number of purchases and total sales for the top 10 customers. I am also going to rename columns for clarity during plots. Here is what the data looks like. Now that the data is formatted in a simple table, let’s talk about plotting these results as a bar chart. As I mentioned earlier, matplotlib has many different styles available for rendering plots. You can see which ones are available on your system using plt.style.available . I encourage you to play around with different styles and see which ones you like. The final customization feature I will go through is the ability to add annotations to the plot. In order to draw a vertical line, you can use ax.axvline() and to add custom text, you can use ax.text() . Up until now, all the changes we have made have been with the indivudual plot. Fortunately, we also have the ability to add multiple plots on a figure as well as save the entire figure using various options. 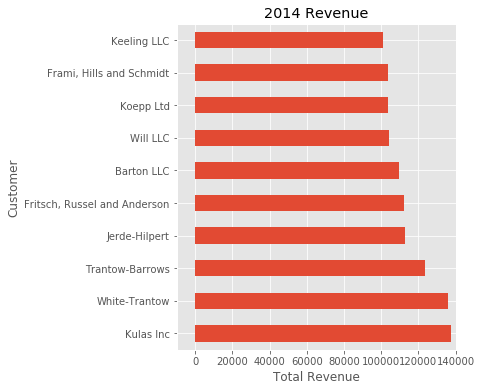 I am also using sharey=True so that the yaxis will share the same labels. This example is also kind of nifty because the various axes get unpacked to ax0 and ax1 . Now that we have these axes, you can plot them like the examples above but put one plot on ax0 and the other on ax1 . Up until now, I have been relying on the jupyter notebook to display the figures by virtue of the %matplotlib inline directive. However, there are going to be plenty of times where you have the need to save a figure in a specific format and integrate it with some other presentation. This version saves the plot as a png with opaque background. I have also specified the dpi and bbox_inches="tight" in order to minimize excess white space. Hopefully this process has helped you understand how to more effectively use matplotlib in your daily data analysis. If you get in the habit of using this approach when doing your analysis, you should be able to quickly find out how to do whatever you need to do to customize your plot. As a final bonus, I am including a quick guide to unify all the concepts. I hope this helps bring this post together and proves a handy reference for future use.